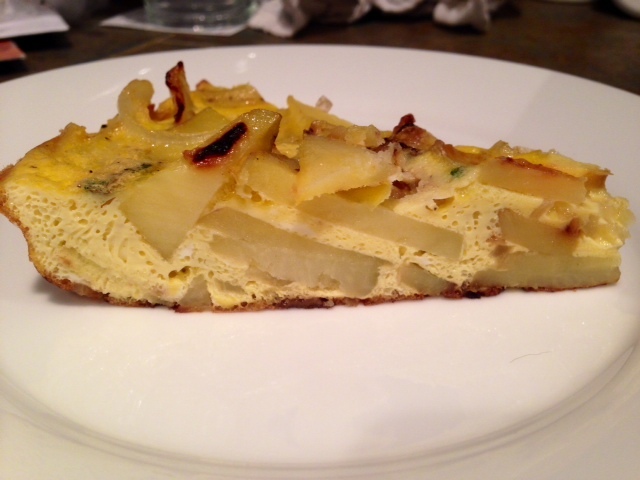 See, I would have called this a frittata. And apparently I would have been wrong. 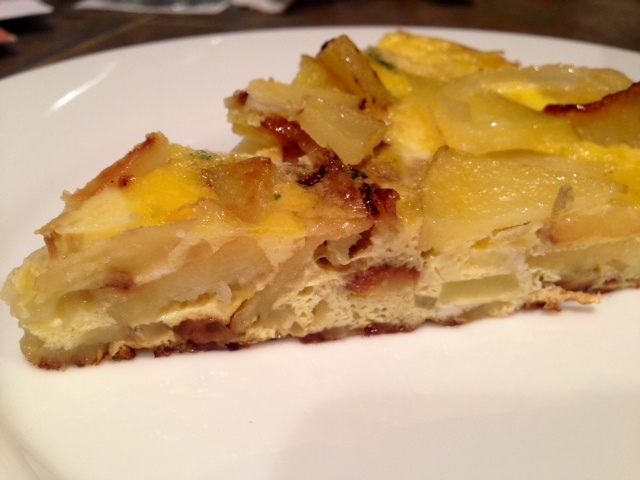 One of my co-workers is half Spanish, and one time he brought in a traditional Spanish tortilla for breakfast. While it looked exactly like the frittatas I’m so fond of, it just had a slightly different flair. 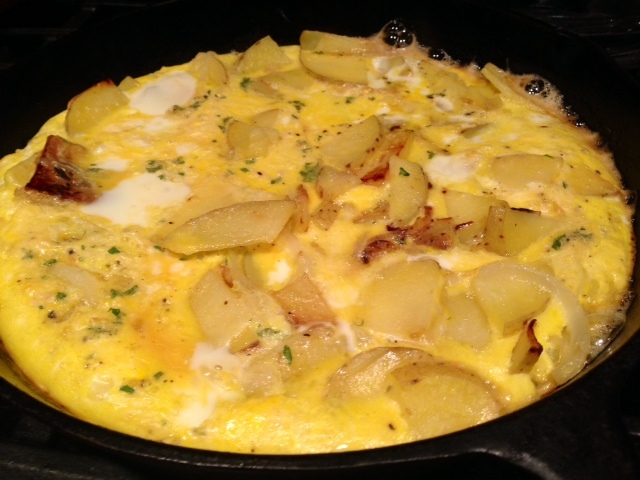 The gold potatoes are delightfully tender and add a delicate base to the dish. Many also include onion, asparagus, chorizo, and other fillings. The recipe below called for tarragon, though I used fresh rosemary and oregano instead. 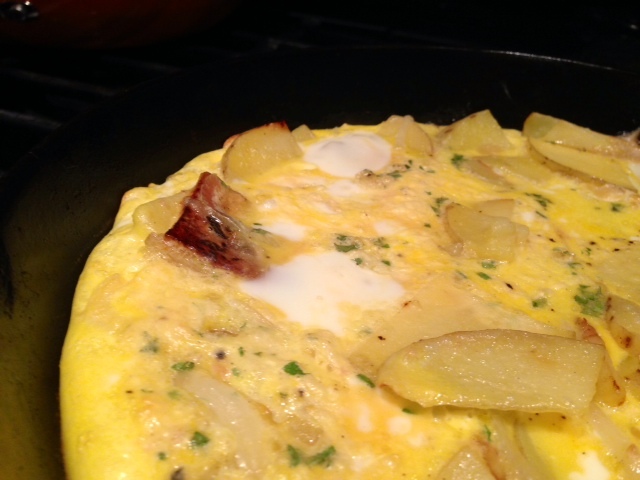 Spanish tortillas and frittatas are very similar, though there are a few differences. 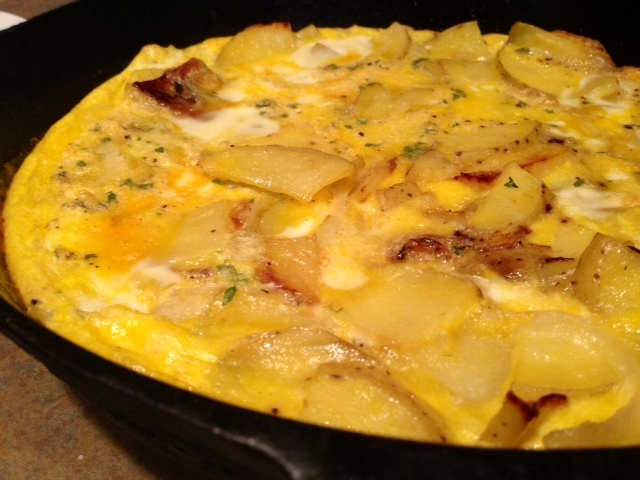 Tortillas are always egg- and potato-based, while frittatas only have to have eggs. Also, apparently the main difference is that you’re supposed to flip a Spanish tortilla on the stovetop at the end, versus finishing in the oven like a frittata. I’ll definitely be trying this method next time—I’m trying to wheedle my co-worker’s recipe out of him! 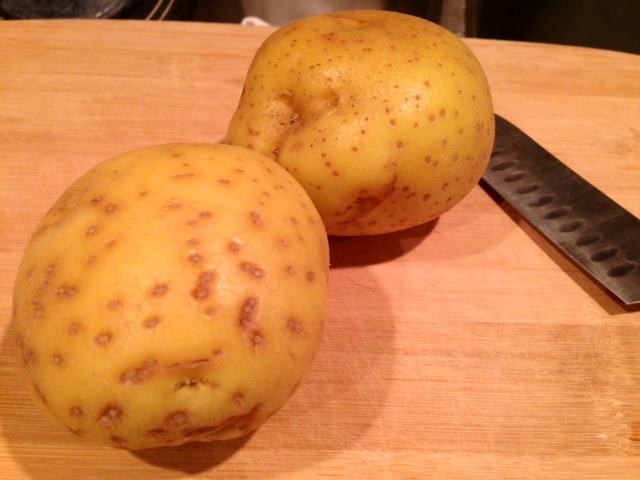 Cut the potatoes in half and slice in VERY thin half moons. 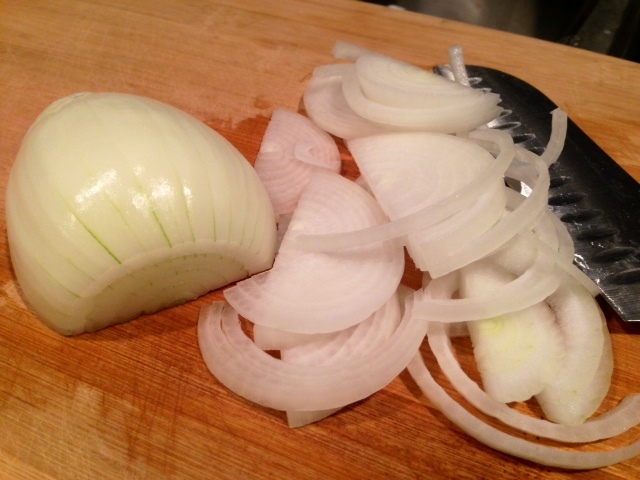 Thinly slice the onion as well. Heat the oil in a 10-inch oven-safe skillet over medium heat, I used cast iron. 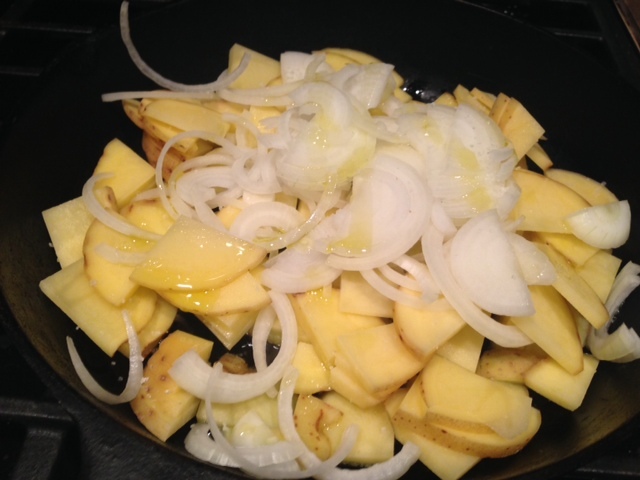 Add the potatoes and onion, cover and cook for 10 minutes, stirring occasionally so they don’t burn. Add the garlic and cook five minutes more, until potatoes are soft but not browned. 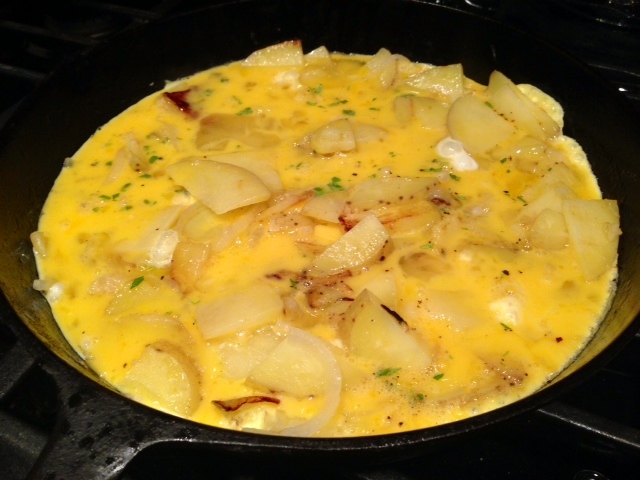 Beat the eggs in a large bowl and add the herbs, salt, and pepper, then pour into the pan. Let the mixture settle a bit on the bottom, then gently run a silicone spatula around the edge of the pan to release the tortilla from the sides. Cook until the bottom is set and the sides begin to set—about 8 minutes. Then place the pan in the oven. You’ll have to watch carefully, you want it just barely cooked, the surface dry but not brown. Otherwise your eggs get rubbery. Start checking after about 5 minutes. Slice and serve—it’s great hot or at room temperature. You can store for several days in the refrigerator. It makes a great breakfast at work! Heat the oven to 450 F. Heat the oil in a 10-inch oven-safe skillet (I used cast iron) over medium low. Add the potatoes and onion, cover and cook for 10 minutes, stirring occasionally so they don’t burn. Add the garlic and cook five minutes more, until potatoes are soft but not browned. Beat the eggs in a large bowl and add the herbs, salt, and pepper, then pour into the pan. Let the mixture settle a bit on the bottom, then gently run a heatproof spatula around the edge of the pan to release the tortilla from the sides. Cook until the bottom is set and the sides begin to set—about 8 minutes. Then place the pan in the oven, but watch carefully. You want it just cooked, the surface dry but not brown. Start checking after about 5 minutes. Remove from oven and let cool.